The Copenhagen Strand is ideally located within the heart of the city, offering guests easy access to the well known Stroget shopping street and other attractions such as Nyhavn. The harbor is located within only minutes of the hotel while Amaligenborg Castle is nearby as well. The Opera House is only two minutes from the hotel. A variety of dining opportunities is located within the area near the hotel. There are also many entertainment venues situated in the local vicinity. The airport is located within just a short distance of the Copenhagen Strand Hotel. The metro and bus stations are also situated near the hotel. Water taxi services are available in the area as well. Guestrooms at the Strand Hotel Copenhagen feature trouser presses, hair dryers, private baths, mini-bars and in-house videos along with cable television. There are 174 well appointed guestrooms at the hotel. 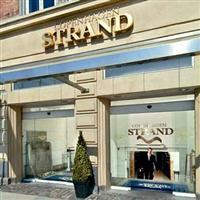 Amenities offered at the Strand Hotel Copenhagen Denmark include a breakfast bar, event space, lounge, business center, valley dry cleaning services and a reception area.